Visual / Sonic Art Events: A Promulgation of Adventures in Sight / Sound: Wong Kar-Wai's new film "2046"
Wong Kar-Wai's new film "2046"
"Filmmaker Wong Kar-Wai finds himself 'In The Mood For Love' all over again in this sumptuous semi-sequel to his 2000 cinematic masterpiece. Tony Leung returns to play Chow, a dissolute writer in 60s Hong Kong who funds his nightly debauchery by writing newspaper articles and sci-fi serial stories set in the year '2046'. As he romances a string of beautiful women (including Zhang Ziyi,Faye Wong and Gong Li), he begins to realise the terrible truth that "all memories are fading traces of tears" and the love of the previous film (played by Maggie Chung) still haunts his life." Nice brief (understated) review to the sequel to one of the visually richest films ever made. Really. Ever. 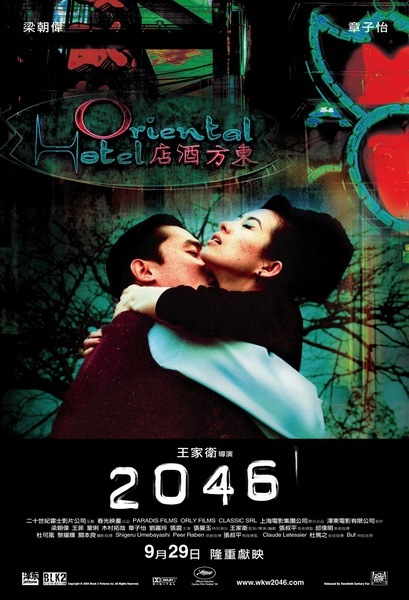 Much in the way that "Fallen Angels" was a sequal for his previous film "Chungking Express" - "2046" is a sequel of sorts to Wongs finest film; "In the Mood for Love". 4 years in the editing and reconstruction/reshooting - this is the end of the story for his emotionally troubled and journalistically adventurous protagonist Chow... and its a sad, forlorn and haunted end.